Note:	This is a Paris telephone number. To call it you will need to dial the long distance access number (in the US and Canada, it is 011), then the country code, 33. Finally, dial the number above without the zero - the area code for Paris is 1 (What else did you expect?). If you think that hauling your sax from one jazz gig to the next is a pain, of you are fed up with your Fender and bollixed by your bass, then you must feel nothing but hero worship for Isabelle Olivier. Olivier plays jazz harp. No, not the Hohner variety. 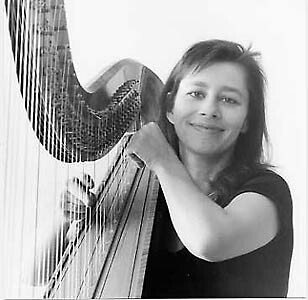 Harp - as in concert harp with a lot of long strings and pedals and a big frame. But let's back up a little. I was visiting the crown of Western civilization, France. In particular, the crown jewel of Western civilization, Paris. The date was March 9, 2000. 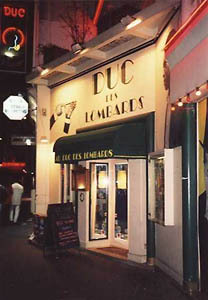 I was seeking a good jazz club and happened on Duc des Lombards, one of the finest clubs in Paris, and therefore in the world. It looked crowded, but my companion and I squeezed into the tiny entrance. Everything was whispers - the musicians were playing. I could see, on the stage a - harp? The music filtering through was magical so I bought the CD which was on sale and took the leaflet advertising the about-to-be-released new CD and left. 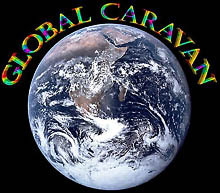 The following night, we returned, but there was a different group, also excellent (more on them at another time) and no more information about the jazz harpist, Isabelle Olivier. A few months later, I was able to get the new CD, too. 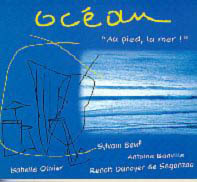 The CD I bought that night, Au pied, la mer means roughly, "At our feet, the ocean." Olivier's group, Océan, conceived it as part of a long range environmental project. The music on the CD is meant to evoke the ocean and a dream of water. In particular, Olivier wanted to support the International Year of the Ocean, 1998. The group's instrumentation is not extraordinary - reeds, violin, contrabass and percussion - until you add the harp. Olivier uses her instrument as a good jazz instrument which also can enhance the dream-like qualities of the music. The music on both CDs will satisfy almost anyone some of the time. While it embraces a free jazz idiom in parts, the rest of it draws from the melodic, rhythmic and improvisational roots of jazz. All of the performers are formidable musicians. The tenor and soprano saxophonist Sylvain Beuf is a rising star whose exceptional compositional abilities match his playing, both virtuosic and passionate. No one should miss Bô, which entrance the listener with the melodic exploration of drums and harp. The alto saxophonist and clarinetist on Funny Streams, Sébastien Texier, is another great reed player. When he teams up with violinist Nicolas Krassik on their composition, "Duo," the result is a whimsical two minutes of musical mood following Beuf's "Little Boy Song" and then launching into Olivier's energetic "Ressac." Both albums are structured like this. Pieces develop feeling and theme from one to the next. "Le cachalot et les petits poissons" (The sperm whale and the little fishes) is 57 evocative seconds of a crescendo of harp, soprano sax and alto. Immediately following is an evocation of whale music which leads the group into a dream like passage. The same kind of aesthetic characterizes Au pied, la mer. The feelings of ocean and life are just as vivid. The musical structure is just as well thought out. And the musicians in their compositions provide as much feeling as they later put into Funny Streams. Need another reason to long for these discs? The recording and production are first rate on both: clear, musical, subtly nuance where it should be, hard rocking where needed. So let's look at a rating. How do you rate enchantment? How do you rate innovation? How do you rate creativity? How do you rate the ineffable?